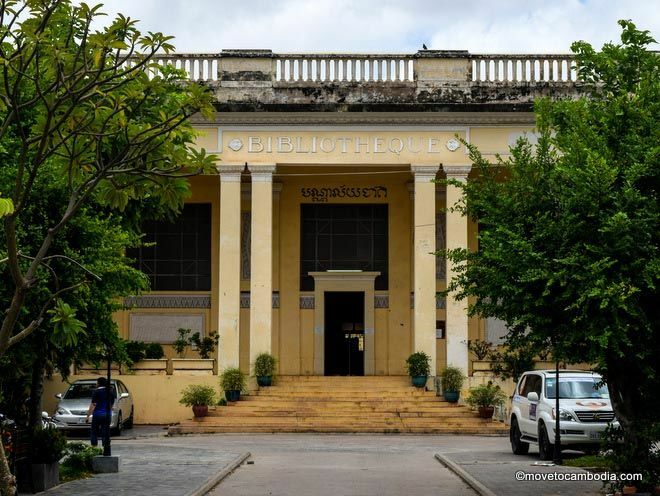 The National Library in Phnom Penh, which stands next to the iconic Raffles Hotel and opposite the Lycée Descartes, is another wonderful example of the French-colonial architecture that once dominated the area near Wat Phnom and the railway station. The single-story library, with its columned portico and Greek-inspired statuary, is surrounded by what was once a lovely garden. 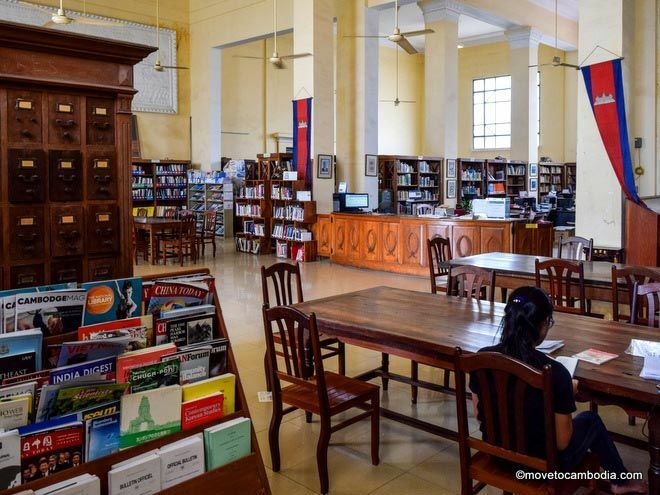 Even though the grounds are now a carpark and Amazon coffee franchise, nevertheless the library has an air of calm that’s rare amid the hustle and permanent construction that dominates much of the city. Inside, the library’s central room contains the reference section, stacks of newspapers and magazines, rows of reading desks, and the dusty remnants of the old filing system. One side room, with a rather elaborate spiral staircase, houses the Patrimonial Section, where Cambodians can trace their family history. With its high ceilings and large, slow-spinning ceiling fans, the library evokes an earlier time. So does the reading material available on the shelves, a trove of obscure publications from decades past: coffee-table books extolling the beauty of the Soviet Union, long-out-of-date law books from the USA, Macedonian library catalogs in Cyrillic, and some untouched works on Scientology. Many of the books were donated in the 1980s, when Cambodia was closely linked to the Soviet Union, courtesy of the occupying Vietnamese. 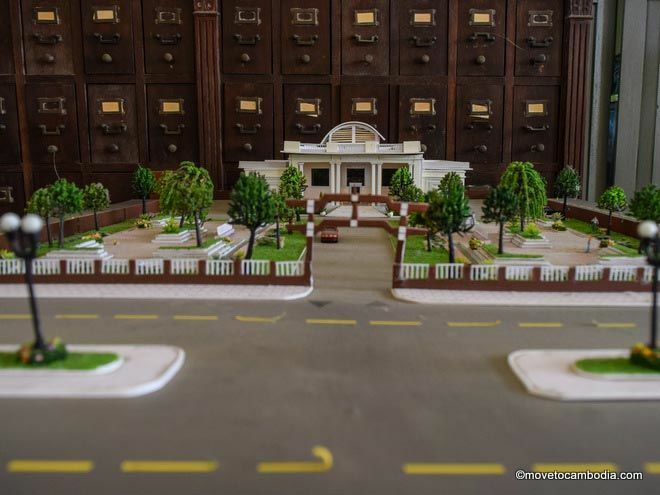 A 1993 article in the Phnom Penh Post reported that some of the Soviet-era books were taken off the shelves after the Vietnamese left in 1991, but many volumes from that era remain part of the library’s sparse collection. Perusing the stacks at the Phnom Penh library. At least some books and documents survived, as well as the building they were stored in. 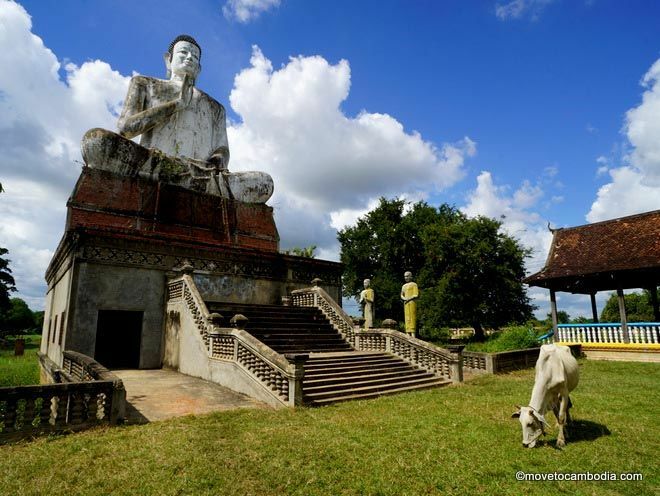 The nearby Notre Dame Cathedral was less fortunate; it was dynamited and totally destroyed by the Khmer Rouge. No idea what this photo is because Pete didn’t provide captions, but it was too good to not use. – Ed. Today there are renewed efforts to boost literacy and reading through support of Cambodian-produced books. 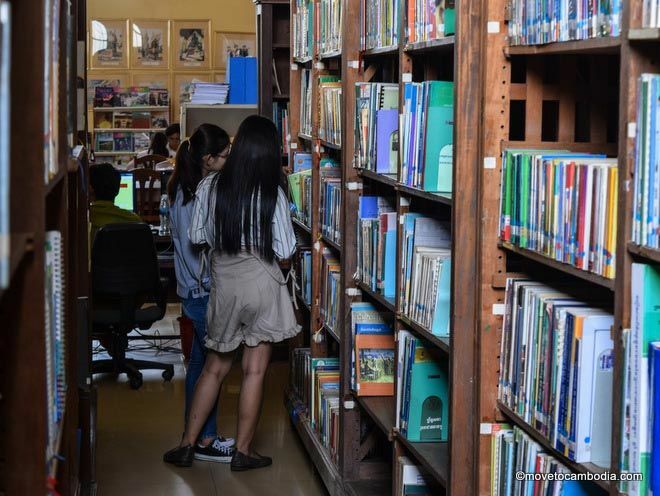 More and more Cambodian authors are publishing, and NGOs such as SIPAR and Room to Read are taking books out into the provinces. The National Library issues ISBN numbers for all local books without any monetary fee, but—in a canny effort to boost the number of books on the shelves—it requires that five copies of each book be donated to the library’s collection. A $10 annual membership allows you to borrow books to take home (bring two passport photos if you want to join), but the library is worth visiting just for its architecture and ambiance. Note that it’s only open during weekday office hours and is closed on all national holidays. Since there are 31 national holidays in 2018, it’s wise check before you try to visit. Open Monday through Friday, 8 a.m. to 11:30 a.m. and 2 p.m. to 4 p.m. Closed on national holidays. 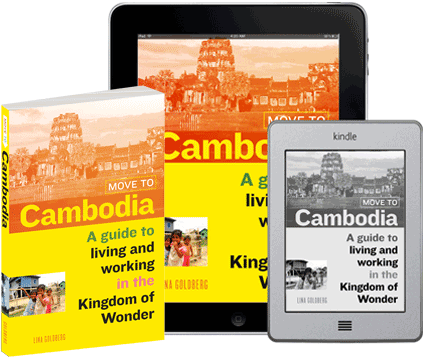 This entry was posted in Art & Culture, Phnom Penh and tagged books. Bookmark the permalink.